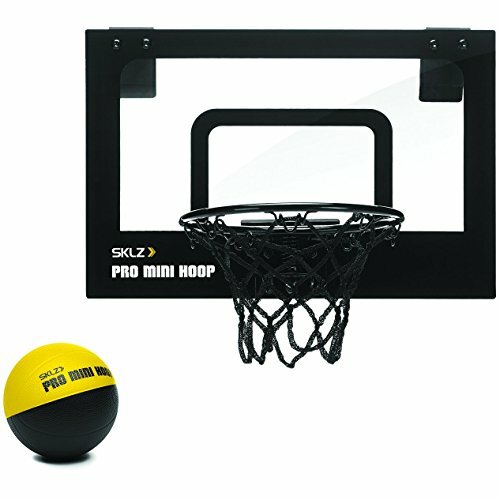 SKLZ Pro Mini Basketball Hoop System. Adjustable Height 3.5 ft. -7 ft. and 7 Mini Ball. The SKLZ Pro Mini XL Basketball Hoop is the perfect way to practice your 3 pointers or free throws without committing to a full game on the court. With a shatterproof backboard, and ultra-durable, 8-loop net, it can handle the swoosh of powerful athletes, and the rough and tumble play of kids. Set it up in your bedroom, basement, playroom, or at the office. With over the door hooks, you can guarantee easy set up for fun, no hassle shots. The foam padding behind the shatterproof polycarbonate backboard and metal brackets reduce noise, so you can shoot hoops anytime of the day or night without the worry of bothering your neighbors, parents, or coworkers. Keep kids active indoors, or take a few shots during the day between meetings or classes. 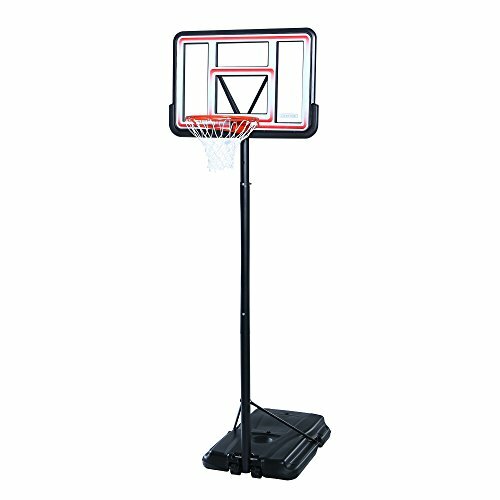 The professional grade basketball hoop with a breakaway rim allows for slam dunks, layups, bank shots, and more. You can be sure that your fun will last, with easy and quick set up. 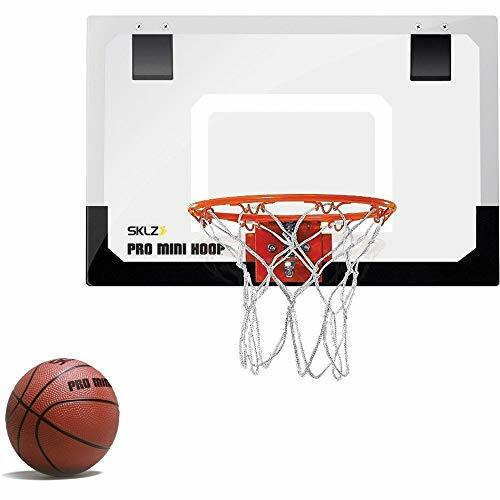 The SKLZ Pro Mini XL Basketball Hoop package includes a 23 x 16" clear polycarbonate backboard, padded brackets that hook over your doorframe, a 5.5 Pro Mini rubber basketball, a 9.5 diameter spring action break-away steel rim, and a wrench. Set up and start shooting baskets in a matter of minutes. With the SKLZ Pro Mini XL Basketball Hoop you can ensure hours of fun with your kids, friends, coworkers, or family. SKLZ is committed to bringing fun to your life with high quality sporting equipment for basketball lovers of every level. " Our basketball nets measure in at 21 inches in length and 12 loops to fit most standard sized basketball rims. These include the basketball rims at your local gym, the park, indoor basketball courts, or even the one you have in your backyard! Our nets are made from thick, tough polyester material that makes it the perfect net for either indoor or outdoor rims. Our nets are heavy-duty and resist to any type of pulling, stretching and tension. So go ahead and hang from the net all you'd like! Our nets are also all-weather proof meaning it can withstand any type of weather conditions such as heat, rain, snow, and high humidity. This makes it a great option for outdoor basketball rims. Don't you hate it when you make a basket only to have the net whip up and wrap itself around the rim? That's called net whip. Our nets are dense enough that it prevents that whipping from happening but flexible and light enough to still give you that sweet swish sound from the perfect shot. No more fishing the net out of the rim! The 12 loop system that most basketball rims feature make it a breeze to install new nets. Just grab a ladder and install your new nets in a matter of minutes! And you'll be putting up shots in no time!  STANDARD SIZE: Our basketball nets feature 12 loops and measure 21 inches in total length to fit all standard-sized basketball rims.  DURABLE AND MADE TO LAST: Made from the highest-quality and thickest polyester fibers, our nets are ideal for both indoor or outdoor basketball rims. Our nets are made to withstand any type of weather conditions and the constant pulling and hanging that comes with regular gameplay.  ANTI-WHIP NET: Our anti-whip technology helps prevent our nets from getting tangled with the rim whenever the ball goes in the hoop, all while maintaining its flexibility to provide that sweet swish sound of that perfect shot!  EASY TO INSTALL: The 12 loops make it extremely easy to install and replace on any standard sized basketball rim. It only takes a few minutes to install!  SATISFACTION GUARANTEE: If you're not 100% satisfied with the high quality of our nets, simply request a refund and we'll give you your money back, absolutely no questions asked! Purchase our nets 100% risk-free! A Division of Russell Brands, LLC, Spalding is now the largest basketball equipment supplier in the world. Spalding is the official basketball of the National Basketball Association (NBA) and Women's National Basketball Association (WNBA), the official backboard of the NBA and NCAA, the official volleyball of the King of the Beach Volleyball Tour and the official football of Pop Warner. In addition to being the leading producer and marketer of basketballs, footballs, volleyballs and soccer balls, Spalding produces softballs under the Dudley brand. Shootin' Hoops Pro Basketball Set Shootin' Hoops Pro Basketball set by Step2 is perfect for growing kids. With an adjustable rim it provides years of play. The rim adjusts from 48" (4 feet) to 72" (6 feet). There are three adjustable positions, four feet, five feet, and six feet high. Shootin' hoops features a large backboard and break-away rim with authentic woven net. Made in USA. Adjustable sizes - four feet, five feet, and six feet positions. Easy to adjust for growing children. Provides years of fun play. Break-away rim with authentic woven net. Base can be weighted down with sand or water (not included) and is equipped with two holders useful for drinks or included basketball. Be a star with the all new Shootin' Hoops Basketball Set. The base includes two built-in holders for drinks or ball storage when not in use. The base can be weighted down with sand or water (not included). Set includes one 6" (15.2 cm) basketball. 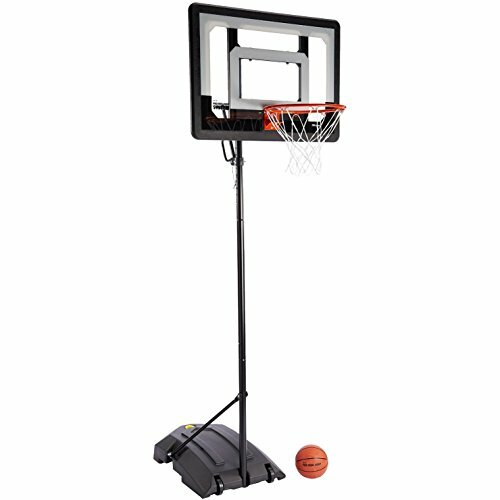 The center pole fixture can be adjusted to a height of 48", 60", or 72"
The SKLZ Pro Mini Hoop Micro basketball hoop and ball lets you practice your free throws all year long. Simply hang the shatterproof polycarbonate backboard over any standard width door so you can make the perfect shot with ease. With pro-style graphics, a sturdy metal break-away rim, 3-ply loop nylon net, and 4 mini foam basketball, you can play game after game where the only damage will be to your opponents ego. Set up your Pro Mini Hoop Micro in your bedroom, basement, playroom, or at the office. Simply hook the hoop over your door for quick and easy set up and unlimited fun. The foam-padded brackets will keep your door protected from dents and scuffs, so you can focus on your game. Keep kids active indoors, or take a few shots during the day between meetings or classes. The SKLZ Pro Mini Hoop Micro basketball hoop with a break-away rim allows for layups, bank shots, and more. With a 15 x 10 backboard, door hooks, an 8 metal rim, and a 4 foam basketball, you ll have access to ultimate entertainment. The SKLZ Pro Mini Basketball Hoop System is perfect for a little 1-on-1, or to practice your three-pointers. This system will grow with your athlete due to the adjustable pole height, from 3.5 ft. to 7 ft. With a shatterproof backboard, and ultra durable, 8-loop net, it can handle intense shots from powerful players and the rough and tumble play of kids. Set this up for some poolside fun, or for your strong athletes for a more competitive game. This mini basketball system is perfect for indoor or outdoor use and will keep you active all year round. As your athlete grows, your basketball system can too. 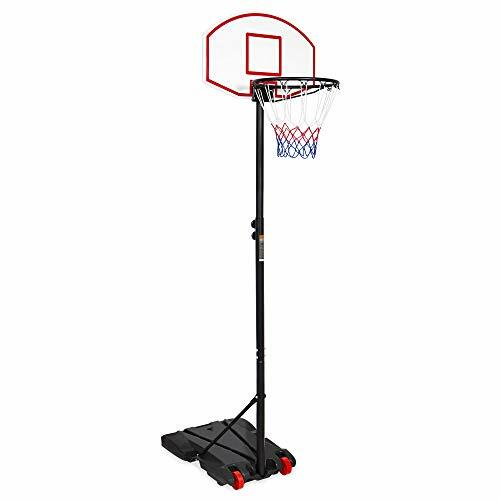 This professional grade mini basketball system with a breakaway rim allows for layups, bank shots, and more. You can be sure that your fun will last, with easy and quick set up. The SKLZ Pro Mini Basketball Hoop System includes a 33 x 23 clear polycarbonate backboard, an adjustable steel pole, and a weighted mobile base on wheels. It includes a 7 Mini rubber basketball and a 14.5 breakaway rim for ultimate fun. Set up and start shooting today. ULTRA-DURABLE AND PRO-GRADE LOOK. The 33 x 23 backboard is made of shatterproof clear polycarbonate, tough enough for the most competitive games. The weighted mobile base (31.6 x 20 x 6.3) fills with sand or water for stability as you practice your shots. PLAY LIKE A PRO. The Pro Mini Basketball Hoop System will give you an authentic basketball experience. 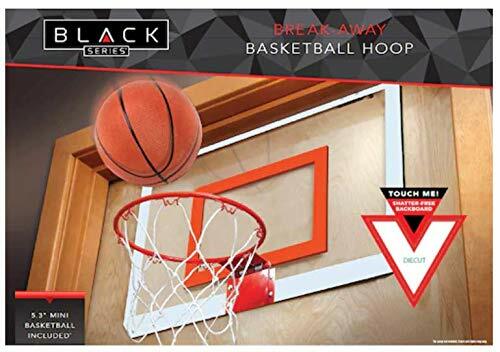 The professional-grade hoop, along with a 7 rubber basketball will give you the game-like action you're looking for on the home court, in the basement, or at the pool. When basketball nets begin to get worn or frayed, it can get harder to land a dunk or layup. To make sure you're able to fully enjoy shooting hoops or for a game, you need to keep your basketball hoop well maintained, and the Pro Slam All-Weather Basketball Net makes it easy to do just that! Our basketball nets feature 12 loops and measure 21 inches in total length to fit all standard-sized basketball rims. These include the basketball rims at your local gym, the park, indoor basketball courts, or even the one you have in your backyard! 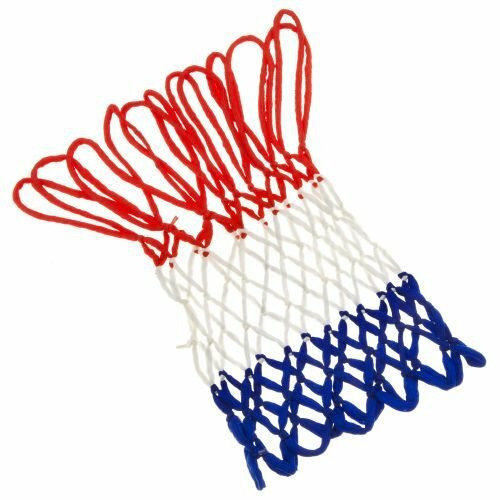 This 12-loop basketball net is made of highly resistant nylon thread, with 15 lines X 4 wisps (=60 lines), providing the fun of professional competition! The 12 loop system that most basketball rims feature make it a breeze to install new nets. It is our duty to provide our customers with the highest quality products. 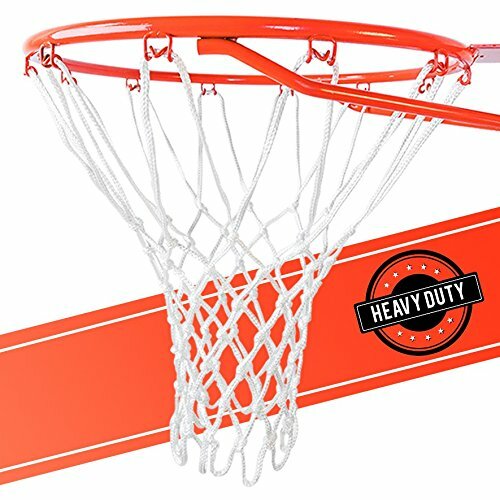 Therefore, if you are not 100% completely satisfied with your purchase, simply request a refund within Amazon's refund window and we'll give you you"
STANDARD OFFICIAL SIZE-Our basketball nets feature 12 loops and measure 21 inches in total length to fit all standard-sized basketball rims. 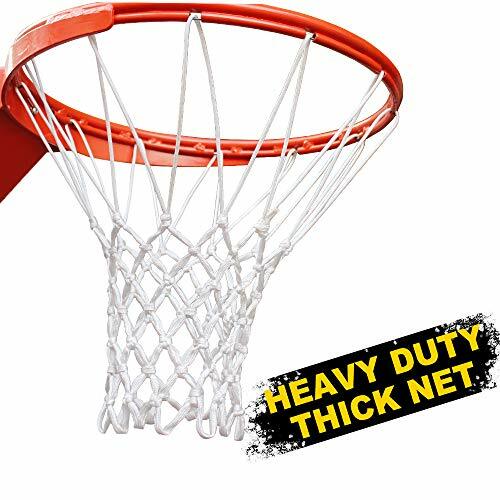 REPLACEMENT HEAVY DUTY BASKETBALL NET-This 12-loop basketball net is made of highly resistant nylon thread, with 15 lines X 4 wisps (=60 lines), providing the fun of professional competition! ANTI-WHIP NET-Our anti-whip technology helps prevent our nets from getting tangled with the rim whenever the ball goes in the hoop, all while maintaining its flexibility to provide that sweet swish sound of that perfect shot! EASY TO INSTALL-The 12 loops make it extremely easy to install and replace on any standard sized basketball rim. The Silverback SB54, our premier in-ground basketball hoop, features a tempered glass backboard and powder-coated steel pole offering the performance of a gymnasium-style goal. This basketball goal offers a revolutionary anchor bolt mounting system allowing you the option to unbolt and relocate your system if you move homes. The SB54 uses a crank actuator to adjust the goal from the NBA and NCAA regulation height of 10 feet to the safety-approved height of 7.5 feet. The SB54 come complete with a backboard pad to offer protection during lay-ups and a break-away rim that flexes under pressure during a dunk. Backed by a 5-year limited warranty, the Silverback SB54 takes hoops to the next level. The Silverback SB54 and SB60, our premier in-ground basketball hoops, feature a tempered glass backboard and powder-coated steel pole offering the performance of a gymnasium-style goal. These basketball goals offer a revolutionary anchor bolt mounting system allowing you the option to unbolt and relocate your system if you move homes. The SB54 and SB60 use a crank actuator to adjust the goal from the NBA and NCAA regulation height of 10 feet to the safety-approved height of 7.5 feet. The SB54 comes complete with a backboard pad to offer protection during lay-ups and a break-away rim that flexes under pressure during a dunk. The SB60 includes a backboard and pole pad. Backed by a 5-year limited warranty, the Silverback SB54 and SB60 take hoops to the next level. 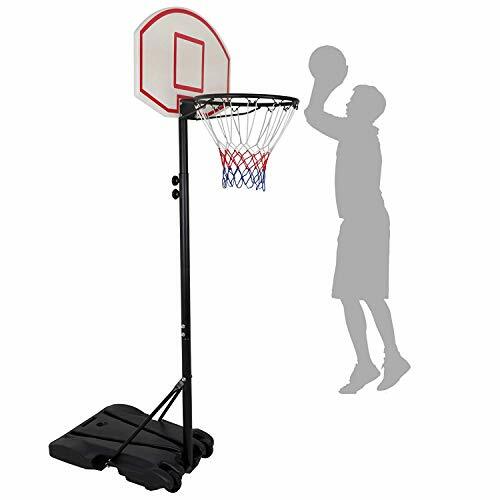 "This portable basketball system from Lifetime Products features a 44"" Shatterproof Fusion backboard with a telescoping height adjustment that adjusts from 7.5 to 10 feet high. It also includes a Classic Rim with an all-weather nylon net and a 2.75"" diameter round steel pole. With a 27-gallon heavy-duty portable base, this system is the perfect residential portable basketball system. " Enjoy years of recreational basketball fun in your backyard with this Lifetime Pro Court Portable Basketball System (model 1269). It features a Pro Court base--which can be filled with sand or water for weighting--and a 44-inch sturdy acrylic fusion backboard, giving you the confidence to go up strong without fear of breaking it. The backboard also offers screen-printed graphics with UV-protected inks, and fade-resistant color. The classic rim comes with a nylon net. The three-piece, 2.75-inch round telescoping pole joins the solid base and backboard, and it adjusts from 7.5 feet to 10 feet in 6-inch increments. Regardless of which system you choose, you'll want to brush up on Backboards 101. Most residential systems feature backboards made of acrylic, fiberglass, graphite, or various other composite materials. While clear acrylic gives the professional look and feel of glass, it is not as rigid as fiberglass or graphite. Some systems may offer steel or aluminum backboards, which are virtually vandal resistant, but don't offer the true rebounding action. The regulation size of an NBA backboard is 72 inches wide and 42 inches high. Most portable hoops are 42 or 44 inches wide and 36 inches tall. In-ground systems tend to be a bit larger, with 54-inch and 60-inch widths being the most popular. While rectangular shaped backboards provide more bank shot opportunities, they are generally more expensive than the streamlined fan-shaped board. 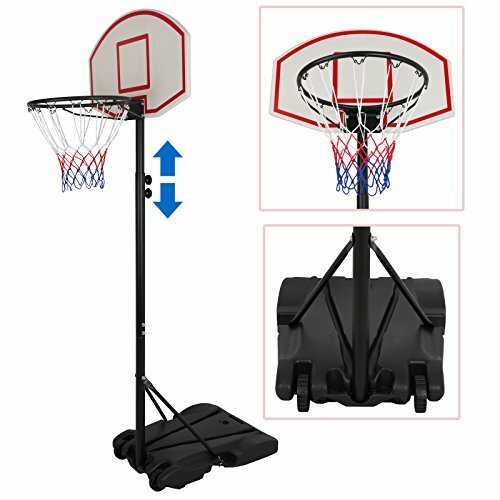 Help your child feel like their favorite basketball superstar with this indoor/outdoor junior hoop. Adjustable from approximately 6.5 feet to 8 feet, it's the perfect size for kids to learn to shoot or even practice jamming on opponents! 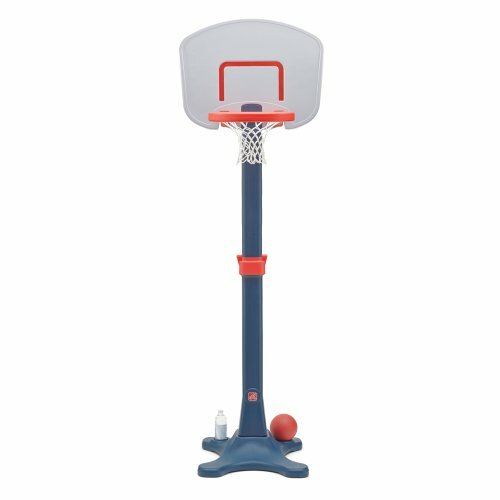 Ensure it will always be stable by simply filling the base with water or sand, so your little baller can shoot and dunk with no problem. This hoop is built with 2 wheels for easy moving, and its durable, weather-resistant design will last until your child is ready for the big leagues! Our basketball stand can give you an authentic basketball experience. With a sturdy base, backboard and construction, it is made to withstand many years of competitive play. Adjustable height allows both adults and kids to have great fun. Wheels on the bottom allow it to be easily moved around for added portability. Heavy-duty basketball rim is built to last and won't break off easily. Our basketball stand can allow you to play your favorite sports for hours right in your house or backyard. 44'' impact backboard is virtually unbreakable. 27-gallon base fills with water or sand to maintain stability. Wheels on the bottom for easy moving and added portability. Telescoping mechanism adjusts from 7.5 to 10 feet. Adjustable Height : Telescoping mechanism adjusts from 7.5 to 10 feet. Also the adjustable height allows both adults and kids to have great fun. When you want to play basketball indoors, it also can satisfy your needs. High-quality Backboard : Our 43'' impact backboard is constructed of high density PC for superior strength and durability. With a sturdy base, backboard and construction, it is made to withstand many years of competitive play. Widely Use : Our portable basketball systemIt is suitable for beach, communities, schools and other indoor and outdoor places. You can play basketball for hours in your house or backyard. Easy To Move : Wheels on the bottom for easy moving and added portability. Lightweight and convenient for moving around. You can enjoy yourself during the period of playing basketball. 100% Satisfaction Guaranteed : It's easy to assemble and disassemble for you. We also provide nice customer service, We would try our best to give you satisfied shopping experience, if there is quality, please contact us by the email, we would make best solution to solve the problem within 24 hours. Designed of portable and lightweight, it is easy for you to assemble. 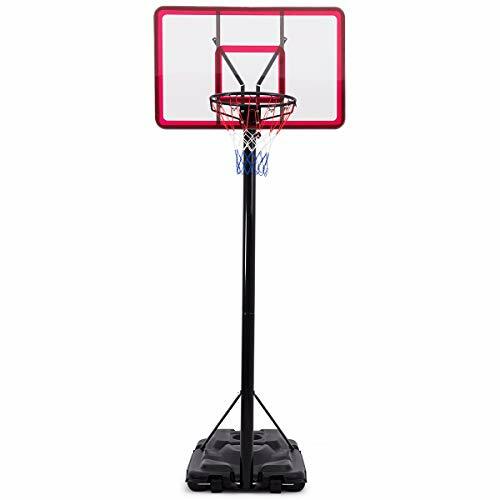 ITEM DIEMENSIONS - Backboard Dimensions 28 x 18 ( L x W ),Adjustable Height 5.4ft - 7ft,Base Dimensions: 29 x 22 x 5.5 ( L x W x H ),Rim Dia: 0.17.ZENY complete mini basketball system includes a height adjustable backboard,rim,pole,and wheeling base,Assemble needed. Enjoy years of recreational basketball fun in your backyard with Nova Pro Court Portable Basketball System.The professional-grade hoop features high-density polyethylene portable bases, all-weather nylon nets, a variety of height adjustments from 5.5 to 7 feet high , fade-resistant graphics, powder-coated steel poles, and heavy duty steel rims for years of reliable fun.It will give you the game-like action you're looking for! Indoor, outdoor, court-side or poolside, bring the Pro Mini Hoop System anywhere! Base Dimensions: 17.75" x 29.5" x 5"
3. Don't recommended for any slam dunk activities, or serious injury may occur. Adjustable Height- Telescoping height adjustment mechanism easily adjusts from 5.5 to 7 Feet letting players of all ages and skill levels enjoy the game on their own terms.Great for kids, junior, youth at 5+ years for full enjoy playing! Durable and Ulitily- 27.9 Impact backboard made of shatterproof clear polyethylene panel 17.8-Inch folding rim constructed of 1.5-Inch steel and an all weather nylon net coated with corrosion-resistant spraying paint,rust and weather-resistant; Designed to withstand the harshest elements tough enough for the most competitive games. Ultra Stability- 30kg Water capacity base provides stability;Fill the base with water or sand so your kid can jam with the confidence that their hoop will stay standing.Basketball Hoop System will give you an authentic basketball experience. Classic Rim- A 16 diameter rim, you can practice your dunks anytime, anywhere. The spring will instantly bounce the rim back into place once you make the shot and the all-weather net will hold up year round. Mobility & Convenience- Bottom configure pulleys,contains 2 heavy duty wheels ensure easy maneuverability, just need to tilt the basketball stand forward, easily move it, convenient, anytime, anywhere!Will ensure hours of fun for all basketball enthusiasts. Now you can bring all the action and excitement of pro basketball to your home, office or dorm. This over the door mini basketball game can be played virtually anywhere!